Banana bread came to mind. I grew up enjoying my mother’s banana bread, made in a dark tin loaf pan but with half the sugar of the recipe (my mom didn’t believe in sugar, or too much of it at least). It was good, but not great (sorry, Mom!). My next choice was the Starbucks banana bread recipe I had copied and tucked in my recipe binder. For some reason the coffee behemoth oddly decided to print the recipe for their banana bread online for a brief while. 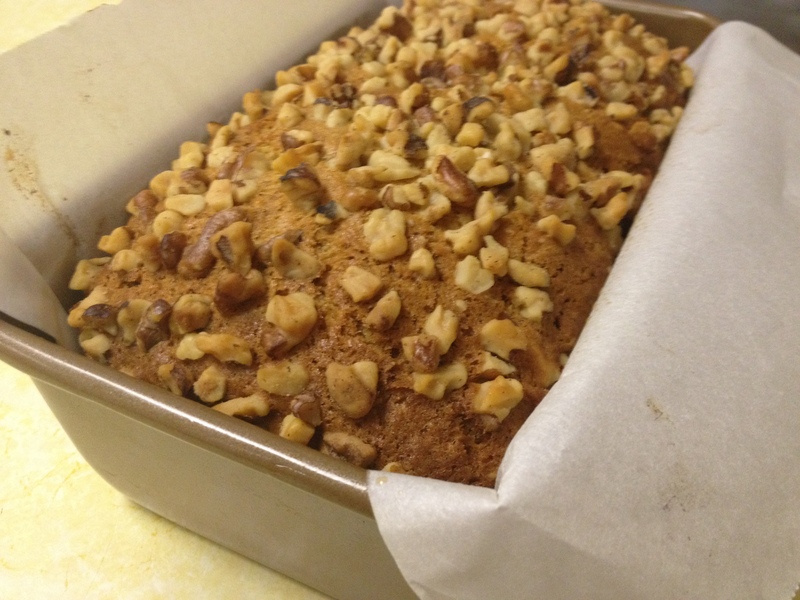 The recipe makes an astonishingly good loaf of banana bread and is even loved by avowed banana bread haters. So, instead of a cronut, I enjoy a modest slice of this bread with my breakfast, content that I am eating bread and cake, but with fruit and nut goodness. My only secret? Not using overly ripe bananas, because I simply don’t like overly ripe bananas in smell or taste. THis is a quick two-bowl recipe, and I did cut the sugar from the original recipe. Mom, you are always right. Preheat oven to 325 deg. one hour. Remove from pan and let cool to room temperature before serving.